An integrated approach to resource planning and management on the Confederated Tribes of the Warm Springs Indian Reservation is mandated by current tribal law and inspired by the beliefs and practices of generations. This approach requires that all resources be considered when setting objectives and envisions the coexistence of a self reliant society and a healthy environment in perpetuity. The management plan for the forested area of the reservation provides guidelines for the stewardship of all forest resources so that future generations have the same range of options that are available today. The Warm Springs Indian Reservation is located in north central Oregon, USA. Approximately 50% of the 259000 ha reservation is forest land. It is home to the Warm Springs, Wasco, and Paiute tribes. Most of the 4000 members of the Confederated Tribes of Warm Springs live on the reservation, of which less than 2% is in non Indian ownership. The crest of the Cascade Range forms the western boundary of the reservation; the slopes are covered with mixed conifer forests (including Tsuga mertensiana, Abies procera, Pseudotsuga menziesii, Pinus ponderosa, Abies grandis) that gradually descend into pine dominated forests (Pinus ponderosa, Pinus contorta) and extend east into high desert communities of bunchgrasses and juniper (Juniperus occidentalis). Geologically, most of the forested area is tied to the formation of the Cascades, which were created by uplift during the Pliocene. The deep valleys and long, gentle to steep slopes and dissected ridges of the area reveal subsequent glacial melt and volcanic activity, which deposited andesites overlaid with pumice and ash. Deep soils typically occur at mid to lower slope positions, whereas upper slopes often have shallow, gravelly soil. The mixed conifer forests are managed to provide an array of commercial, subsistence, and ceremonial products, including timber, deer (Odocoileus spp. ), and huckleberries (Vaccinium spp.). Conditional use areas on the reservation are designated to protect cultural resources. The tribal forest management plan has been certified by the Forest Stewardship Council (FSC) (see Case study 3 for details on the FSC). Mixed severity fire regimes with return intervals of 30 200 years interact with root disease and defoliating insects to create a patchy landscape comprised of multi aged stands. One aim of ecological forest management is to use silvicultural and harvesting systems that match site conditions and forest dynamics. Accordingly, shelterwood systems, variable intensity thinning, and aggregate retention clearcuts are favored on the reservation. Depending on slope, harvest systems include ground based and cable operations. Warm Springs Forest Products Industries, a tribal industry, operates an FSC certified mill on the reservation, so most logs are hauled there over a network of local, state, and federal roads. 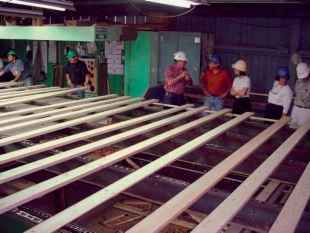 The mill produces framing and industrial lumber, mostly from Douglas fir, white fir, and ponderosa pine; logs of other species are sometimes sold off the reservation to maximize income. An important objective of Warm Springs Forest Products Industries is to provide jobs to tribal members (see Figure 3), and its mission is to maximize the value of the forest resource for the Confederated Tribes of the Warm Springs. Figure 3 Sawmill operations on the Warm Springs Indian Reservation, Oregon USA. The mill can produce FSC certified kiln dried lumber and currently operates a 3 MW biomass power generation facility. It uses an on site boiler to generate steam energy from mill residues. A proposed biomass energy plant might be co located at the mill site. By S. Hummel recognize how a stand is stocked relative to a maximum density. Thinning schedules can then be designed to achieve desired objectives, such as timber production or habitat structure. The diagrams are species specific and derived primarily from research in even age, single species stands. Figure 4 Tradeoff between tree growth and stand density as compared to stand growth and density. Both cannot be maximized at the same time in a single even-aged stand. Reproduced from Long JN, Dean TJ, and Roberts SD (2004) Linkages between silviculture and ecology: Examination of several important conceptual models. Forest Ecology and Management 200: 249-261, with permission. 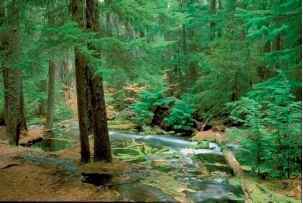 Figure 5 Mixed-conifer forest in the Jack Creek watershed of the central Oregon Cascades USA. Figure 6 Schematic representation of stand development from a regenerating even-aged stand (a), through a series of competitive stages (b and c), to mortality (d), and regeneration of a second cohort (e). Reproduced from Long JN, Dean TJ, and Roberts SD (2004) Linkages between silviculture and ecology: Examination of several important conceptual models. Forest Ecology and Management 200: 249-261, with permission. 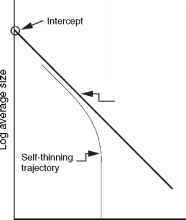 Figure 7 Self-thinning trajectory of an even-aged stand in relation to an upper boundary or maximum relative density line. In theory, any combination of tree size and density is possible below the upper boundary, but not above it. Reproduced from Jack SB and Long JN (1996) Linkages between silviculture and ecology: An analysis of density mangement diagrams. Forest Ecology and Management 83: 1-3, with permission. interception of precipitation, and productivity. Silviculturists are developing ways to use this as a stocking tool that links to other uses of this information. A multiaged stand might have leaf area index divided by age class as a basis for stocking control. Similarly, a mixed species stand could have its leaf area divided by species to determine proportions of different species.